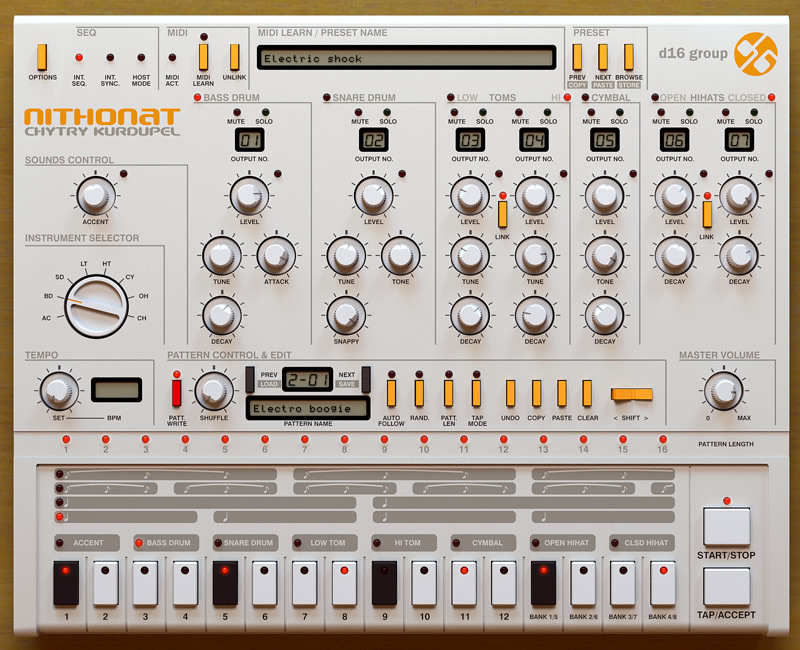 Nithonat is a fully synthesized drum machine based on the classic Roland TR-606. The unique sound of this machine has been used by many artists over the years in the production of Electro, Hip-Hop, R'n'B, etc. Nithonat emulates the original 606, however, since Nithonat is software based, D16 were able to enhance the original with extra functionality. On the original 606, the only editable sound parameter was volume. D16 has added to the original and as a result, Nithonat is equipped with extra controls which allow each sound to be shaped in ways which were not possible in the original machine. A whole spectrum of sounds is now at you fingertips – rumbling kicks, rustling snares and completely synthesized and unnatural sounding toms and hi-hats. Nithonat has very unique and characteristic hi-hat and cymbal sounds which are due to the emulated structure of the circuits in the original. The bass drum has unparalleled attack character and strong punch. The snare sounds sandy. Nithonat has a powerful built-in internal sequencer. The tracks can be edited in a simple and intuitive way and modified with many useful functions. The clear GUI means that sequencer is easy to use. In addition to having many internal sequencer modes, Nithonat can also be used as a sound module. All sounds and functions within Nithonat can be controlled from a host sequencer. Additional parameters to get yet more control over the sound. External mode (notes triggering the sounds). 8 banks with 12 patterns per bank. Each pattern up to 16 steps of length. Each pattern defined with one of four available measures. Shuffle (swing) and tempo values defined per pattern. Patterns import/export via human readable xml files. Precise synchronization to the host tempo. Synchronization to internal clock - tempo controlled in the range 30-300 BPM (+-0.1). Mutes/solos for each instrument (affect triggering not just the signal). Dynamic signal routing from instruments to outputs. Drum kits organised into groups.